There are many solstice markers in Petrified Forest National Park that scientists from all over the world gather at on the first day of summer to study and document. One is located at Puerco Pueblo, site of the prehistoric Puebloan ruins. 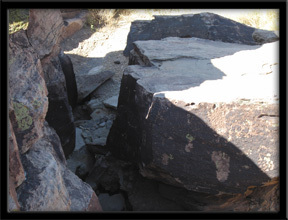 A petroglyph in the form of a spiral, easily viewed from an overlook, is pecked into the rock. Amidst several petroglyphs that have been chiseled here this one alone interacts with the sun. On the day of the summer solstice a beam of sunlight makes it’s way through a chasm in the rock directly to the center of the symbol. Researchers believe this was used by the ancient ones as a solar calendar. This entry was posted in National Parks, Petrified Forest and tagged Northern Arizona, Painted Desert, Petrified Forest National Park, petroglyphs, summer solstice. Bookmark the permalink. This is a place that has always fascinated me and I would love to visit someday!